I'm a fiction writer from Newton, MA. 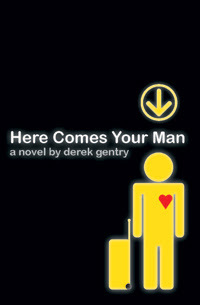 My first novel, Here Comes Your Man, is available in paperback and e-book formats from Amazon.com, BN.com, and Apple. A Turkish edition of Here Comes Your Man is available from Arunas in Istanbul as Senin Erkeğin Benim. "With wit, heart and intelligence, Derek Gentry's Here Comes Your Man reminds readers that you never know what is around the next corner or on the next page. Those who enjoy Nick Hornby will devour this book." "Walks a wonderful line between Douglas Coupland's quirkiness and Nick Hornby's big heart." Ceci n'est pas un gâteau. This electronics habit, combined with my love of books, would seem to make me the ideal user for Amazon’s new Kindle 2 reading device. I’ve never actually held a Kindle in my hand, but it sounds pretty cool: a ten-ounce tablet capable of storing 1,500 electronic books, which you can purchase 24/7 using the Kindle’s free “Whispernet” wireless service. The Kindle 2 even has a text-to-voice feature that will actually read your books, magazines, and newspapers to you, if you like that sort of thing. I won’t be getting a Kindle, however, because I just don’t see it meshing with my current program of buying way more books than I will EVER have time to read and letting them accumulate in every corner of the house: some on my nightstand, a few more on the kitchen counter, a small collection in the living room, and several precarious towers on the floor by the bookcase. On an intellectual level, I recognize that I don’t have as much reading time as I did when I was an English major at UMass, but that doesn’t seem to stop me from walking into bookstores and convincing myself, over and over again, that I will somehow find time to read THIS book. And even when I’m willing to admit that I don’t have time right now, I tell myself that I must have this book at the ready when the rare and miraculous reading moment does arrive (i.e. the next time I can’t sleep). Until then, I can at least enjoy my books as the beautiful objects that they are, occasionally picking one up to lose myself in its cover art or the pulpy scent of its pages. More often though, I’ll just end up knocking a heavy stack of them onto the floor while feeling around for the TV remote, or I’ll spend an hour looking for something important only to discover that it’s under a pile of stupid fricking books. Which is just another way of saying that the books’ very physicality exerts a subtle but constant pressure that eventually results in—TA-DAH!—my reading one of them. Okay, so maybe I have to buy sixteen different titles before I reach this point, but still…reading is a good thing no matter how it happens, right? And somebody has to keep the publishers in business. Clearly, getting a Kindle would upset the delicate balance of my life. If I could download any book at any time of the day or night, I could no longer justify buying them preemptively. And because I wouldn’t be getting a pretty new paperback or hardcover to fondle, I’d have even less desire to acquire anything until the moment I felt moved to read, which might never happen, given that I wouldn’t be tripping on books everywhere I went. So what would motivate me to read...ever again? My fear is that I would just toss the Kindle in a drawer and go back to watching TV. INT. LIVING ROOM – NIGHT: Derek sits on his couch in front of his big-screen TV. An Amazon Kindle 2 rests on the table beside him. KINDLE: Dude…didn’t you tell me that you were too busy to read? Why do I hear the TV? DEREK: I don’t know. Leave me alone. K: Wait—are you seriously watching Kath & Kim? D: Well, yeah, but…I’m just waiting for The Office to come on. K: It’s a rerun this week. D: Yeah, but 30 Rock is on after that. K: Dude, you should totally read a book right now. K: You liked Jhumpa Lahiri’s Unaccustomed Earth, right? K: Well, customers who bought that also enjoyed The Brief Wondrous Life of Oscar Wao. Oh, and The Story of Edgar Sawtelle, which Oprah practically soiled herself over. You must know her, right—she’s on the TV too. D: Yeah, I don’t know…I’m feeling kind of fried. Now, I’m not completely out of my mind; I know that today’s technology wouldn’t allow you to converse with your Kindle. However, we do have the technology to allow some tattooed cube-dweller in Amazon’s Seattle offices to connect via Whispernet—which is really just Sprint’s cell service—and pretend to be your Kindle (thus all the “dudes”). And you know, I think I’d be fine with the pretending. I might even pay a small monthly fee for it, as would a large number of lonely people. So, please consider it, Amazon. The way I see it, everybody wins: you get to sell me yet another battery-powered hunk of plastic, I keep reading (sort of), and our house is a whole lot tidier. No Kindle here, either. Or iPad. 'Cause as you say, there's definitely a bonus to having books about to remind you that they’re about.